The experimental limited release program is well and truly up and running at Moon Dog now they've assigned Señor Brewer Adrian McNulty permanently to their smaller original brewery with instructions to go hog wild. And, for his latest bottled release, it's fair to say inspiration comes from left field – particularly with cricket season still a way off. Said inspiration is Sir Curtly Ambrose, one of the fiercest pacemen to stalk the planet in the latter days of the West Indies' decades of dominance. Indeed, in conversation with Sr McNulty, the question was posed: "Would you say it tastes like having a 6'7" Antiguan bear down on you?" While there's been a fair bit of travel, adventure and exploration squeezed into the past 41 years (including an hour in the nets at Lords with John Emburey pinging the ball down – and Imran Khan looking suitably swarthy in the next one along), it's not a question that can be answered with any degree of certainty. 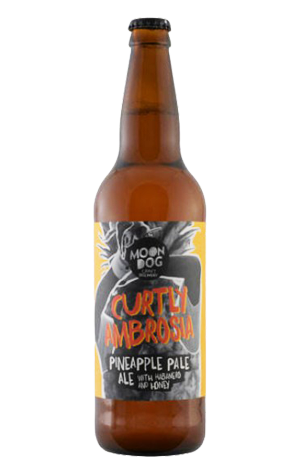 What's more, working out what exactly Curtly Ambrosia is in beer form is a challenge of its own. According to the label, it's a pineapple pale ale with habaneros and honey. But, even with the addition of the omnipresent Mosaic hops, don't go into this with expectations of a hoppy pale ale in mind. After much consideration, if anything, it's probably closest to a strong Belgian golden ale or tripel, but even then... with added weirdness. It's hazy and pale with a big, rolling body (like Curtly) and fires off aromas of peppery capsicum, ripe pineapple, banana (not candied banana like a hefe, just banana) and honey malt sweetness (like Curtly's breakfast perhaps) with that full, malty, boozy sweetness joined by a prickly chilli burn when consumed. So, Adrian, shall we get a bottle to Tugga and see if he can answer your question?